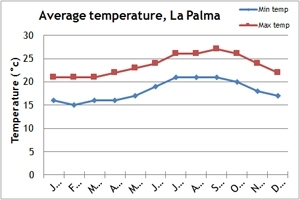 Our climate charts show the best time to visit both Santiago in Galicia, northwest Spain and La Palma in the Canary Islands. Walking the Camino del Norte to Santiago de Compostela is best done in the spring or autumn months of May, June, September or October. At these times of the year the temperatures are generally warm but not too hot for walking, the route is quieter than during the peak summer holiday season and accommodation is more readily available. 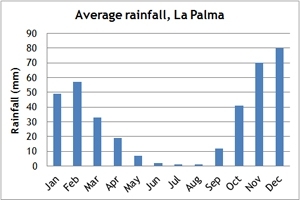 La Palma is a great all year round destination for walkers as the temperature doesn’t vary enormously between seasons. Even in the winter months the average is around 20 degrees which is very pleasant for walking. The hottest months are July and August, which are also the driest. We have planned the dates of our group walking holidays in Spain to coincide with these premium conditions. If you would prefer to travel at other times, please call and speak to one of our travel experts who can arrange a private departure or a tailor made holiday to Spain at dates to suit you.